Click here to go directly to the websites of Puffin Fishing Charters & Alaska Offshore Outfitters. 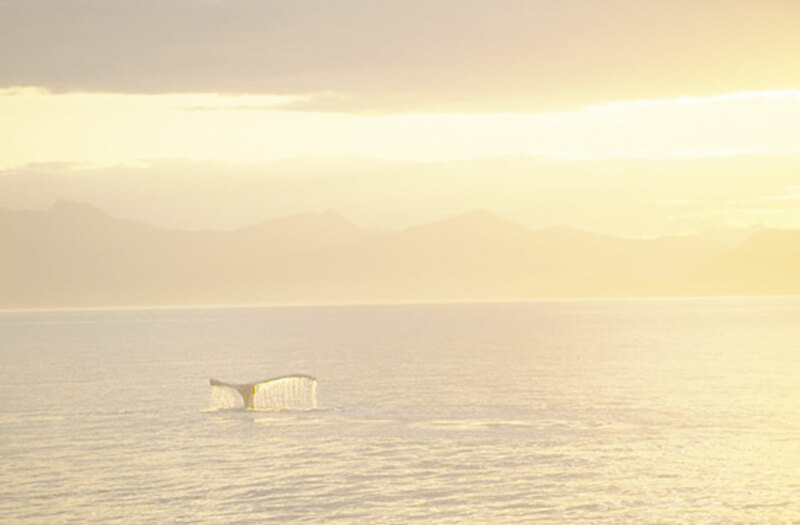 There you will find all the information you could ever need for fishing in Seward. Silver salmon offer an exciting day of fishing due to their acrobatic skills of leaping, jumping, diving and all the other tricks they will use to get off your hook. Pound per pound Silver Salmon are one of the most acrobatic and enjoyable fish that you can catch. Silver Salmon caught within Resurrection Bay and the Gulf of Alaska usually run in the 8- 14 pound range with exceptions reaching up to 22 pounds. The waters are so abundant with feeder fish and the Silvers are voraciously feeding prior to running into fresh water for spawning that these fish can gain a pound or more a week during mid to late summer. The Silvers begin to show up most years in late June to early July and usually are around through September. Although there are thousands of Silvers returning to our waters each season there seam to be times that are really peak. Nothing compares to hitting the Silvers at their peak where they are schooled up and feeding. Let’s just say that you will find very little time to even stop for a drink or a bathroom break. Pacific Halibut can live for over 50 years and can reach weights in excess of 600 pounds. Although the average sport caught Halibut weighs in around 20- 40 pounds bragging rights really begin at 100 pounds and trophy status is achieved at 200 pounds. 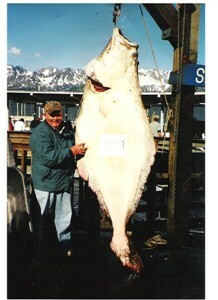 The current IGFA world record Halibut weighed in at almost 500 pounds. Another fact about the Pacific Halibut is that all of the really big ones, exceeding 100 pounds, are females and are the breeders. Catching a Pacific Halibut is quite a thrill and a battle that you won’t soon forget. If you are lucky enough to hook into a fish of 70 pounds or more you can expect quite a fight. This is a fish that likes the bottom and prefers to stay there. You will experience many muscle jarring head shakes on the way up and once the Halibut is shallow enough to see the light from above the fight intensifies. Bring your video cameras if you have them and take turns filming yourselves straining against a fish that is solid muscle.Once you get your Halibut to the surface our highly experienced crew will step in to assist you in getting it into the boat. While you are fighting the fish the crew will be gathering up the necessary tools to assist in landing the fish into the boat. We even shoot the big ones (100 pounds +) with our 410 gauge snake charmer prior to bringing them on-board. This is a safety precaution as 100 + pounds of pure muscle fighting for its life can do damage to us and the boat. For the adventure of a lifetime, experience the adrenaline-filled rod-bending action of hunting Salmon Sharks. These predators are the largest and most fierce game fish in all Alaskan waters. These relatives of the Mako and Great White Sharks are as fun to battle, as they are good to eat. The biggest surprise awaiting the first-time Shark hunter is the acrobatic nature of the fight. These huge carnivores will clear the surface of the water, jumping and thrashing during the battle. These sharks commonly attain lengths of 8-10 feet and weights of 400-600 lbs.. Salmon Sharks will gather into large schools and follow and feed on the huge schools of Salmon that enter the North Gulf Coast waters each year to spawn. We take a maximum of 6 anglers on our Shark Hunts and we encourage catch and release. One shark can feed the family and friends of all those on board the boat. Look for our shark special with the Hawg Quest show found on Fox Sports Northwest.